It never ceases to amaze me that the country at the heart of this entire region’s hate and discontent for sixty years is the size of New Jersey. What’s more incredulous is the contrived American perception of all the problems arising from the region gets to be summed up by our media’s loose definition of facts wherein a bunch of Palestinians are blowing up a bunch of innocent Israelis who just want to live in peace. As such, whatever the Israelis do to the local Palestinians (or any other country in the region) is more than justified. Venturing into the Twilight Zone, I wonder how the people of New England (or America as a whole) might accept the following hypothetical scenario: One day the ‘minority’ Cape Verdean population in Massachusetts declares an independent state where Cape Cod lawfully existed before. Would we tolerate not only the seizure of all the real estate known as ‘the Cape’ as well as the rounding up the indigenous Cape Codders and their being forced to live in Provincetown behind barbed wire? Would we tolerate (say, weekly) 40 or 50 Cape Codders shot in response to some rock throwing incident and continuously hearing the blame foisted on the mayor of Provincetown for the actions of those refugees? Would Americans ‘blame’ the extended family members of those Cape Cod residents residing in Massachusetts, New Hampshire or Vermont if they tried to help their family members, living in tents on the dunes of Provincetown having limited water or even food. Would we (in America) blame anyone for blowing up a Cape Verdean check point or taking a shot at one of their soldiers now and again? If the Cape Verdeans, claiming Cape Cod, decided to extend their sovereign claim to more of Massachusetts and beyond and ethnically cleansed the area, would those of us with family there be expected to accept this outrage as a fiat accompli regardless of how many years went by? I’m guessing not because, call me stupid, I just don’t see all of Cape Cod as ‘belonging’ to the minority Cape Verdeans living there. Of course, the zionist Israelis will tell you that ‘God’ gave them the land and they are justified in taking it back but, since God didn’t return my call for confirmation of this claim, let’s just look at some ‘secular’ history. Last time I checked, any vestige of ancient Hebrew statehood was shattered in 70 AD by the Romans, so one needs to go back an absurd number of years to justify the establishment of a ‘state’ based upon some previous Jewish ‘government’ in this region. By this logic or ‘yardstick’ the British should be willing to give up their country to the Romans or the Saxons who have a ‘historical claim’ to their island. How might red-blooded Brits respond to Italy sending their navy to reclaim the United Kingdom for Rome? Perhaps we Americans should be expected to pack up and move back to Europe, China, Africa and where ever else our descendants came from in that there’s someone out there who’s people lived here before us. Unless you’re willing to leave America, today, with nothing but the clothes on your back, based upon this claim, I think we can see the absurdity in the zionist argument. There appears little difference between my Twilight Zone example of the Cape Verdean takeover of Cape Cod and the middle east reality that when zionists invented Israel, Palestine’s population numbered about 500,000 Muslim Arabs, 100,000 Christian Arabs, and a mere 60,000 Jews. Representing 10% of Palestine’s population, it’s a bit of a stretch to justify a Jewish ‘state’ based upon the population figures but if one can, one should as readily accept the suggested Cape Verdean minority’s takeover of Cape Cod. 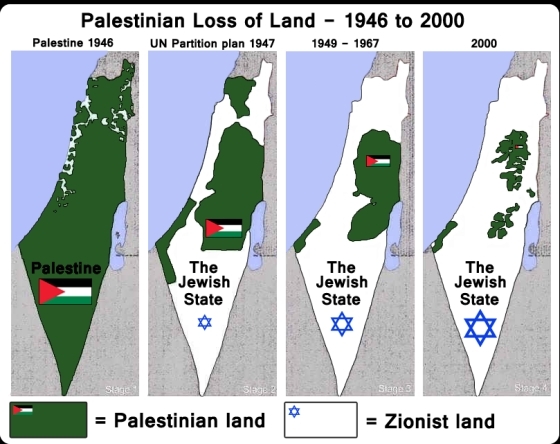 It’s accepted FACT that over the decades, much to the chagrine of the local population (Muslim & Christian alike) who lives there and owns title to the land, Israel has conquered more and more territory and ‘annexed’ the territory to the land originally ‘claimed’ as being the state of Israel in 1948. 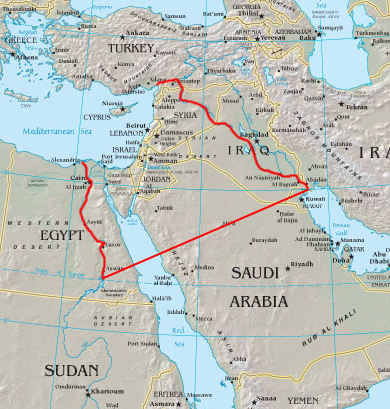 This Israeli policy, commonly referred to as “Greater Israel”, seems relatively acceptable to many folks. I find this odd since territorial annexation by way of conquest, wherein one country seizes another and subsequently incorporates it into its own territory, is “illegal” under International Law. Why, I might ask the reader is Israel’s annexation of territories and the term “Greater Israel” acceptable while Germany’s ‘annexation’ of foreign territory such as the Sudentenland, Austria and parts of Poland during the last World War and their term “Grossendeutches Reich” is frowned upon in the history books? With these annexed territories Israel has, at an ever increasing rate, colonized them through resettling the ‘owners’ of the land elsewhere, bulldozing their properties and building settlements wherein only Jewish folks are allowed to live. This government “settlements” policy of effectively expanding the living space of the Israeli state, too, seems acceptable to many who reside outside the middle east, not the least of which are those who hope and fantasize about being the president of the United States such as Palin, Romney and Huckabee. 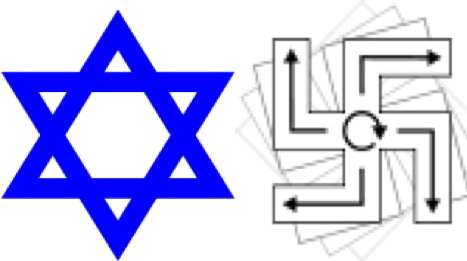 Interestingly, the Germans called their official policy “Lebensraum” which translates from German to “living space” and it was a policy instituted by the Nazi government wherein once ‘occupied territories’ were pacified, the government in Berlin subsidized the ‘settlement’ of these areas with ethnic Germans on the best land, just as Israel does with your tax dollars in the occupied territories. The indigenous population – of course – had to ‘go’ (just like the Palestinians) in order to facilitate the settlement of ethnic Germans. These displaced people were forced to “relocate”. Forced deportations (relocation) of indigenous people was subsequently declared by the world a “war crime”, prosecuted during the Nuremberg trials and later to be codified under the Fourth Geneva Convention which states rather clearly in Article 49 that “the Occupying Power shall not deport or transfer parts of its own civilian population into the territory it occupies”. I wonder why wholesale Israeli deportations and their official policy of “Lebensraum” is acceptable while the Germans were hung for it just prior to the state of Israel’s establishment. So the Palestinians as well as Israel’s neighbors loose their land to conquest and it’s annexed into “Greater Israel”. The indigenous population (Muslims & Christians) are deported from their land and forced into smaller and smaller enclaves called “camps” in Gaza and elsewhere where they’re forced to live behind barbed wire and faced with tanks and trigger happy troops. When any of these folks have the temerity to resist the Israelis, our media calls them “terrorists”. Oddly enough, when I watch the History Channel, I see them immortalizing the Jewish men, women and children as “heros” who resisted the Waffen SS from January 1943 through April 19th 1943 from the cellars, buildings and streets of the Warsaw Ghetto, an enclave remarkably like Gaza. So, I guess I’m missing something significant (or maybe not) in that Israel gets to unilaterally declare statehood and force the folks having a different religion than theirs out of the country similar to the policies of the Third Reich in the 1930s. Then they get to conquer their neighbors territory and annex it to create “Greater Israel” just as the Third Reich did in the creation of their “Grossendeutches Reich”. Then they get to deport everyone from there and build “settlements” for only Jews under the auspices of the ‘Israeli Land Council’ just as the Third Reich’s policy of “Lebensraum” did within their “territories” controlled by the Reichskommissariat Ostland. Then they get to put the deported people into “camps” where any resistance to these policies is met with brutal and deadly surpression by the IDF just as the Reich’s Waffen SS did within the Warsaw Ghetto. and the fact that the Germans went into battle in snappy, almost parade quality uniforms versus the drab utilitarian garb of the IDF, just what exactly makes the policies of Israel different to that of the Nazi’s Third Reich? 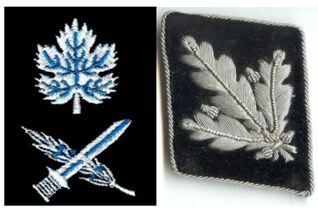 Along the same line of questioning, if the Cape Verdeans wear boring uniforms like the IDF can they justify stealing Cape Cod from the present owners or does their being ‘Christians’ bar them from the righteous ethnic cleansing of the Cape and any other parts of the United States (yet to be determined) they may choose to take by force? Finally, how might we feel if the Red Chinese were supplying advanced weapons and billions of dollars to those Cape Verdeans? This entry was posted in Foreign Affairs, International Law and tagged annexation, Arab, Christian, deportation, Greater Israel, Grossendeutches Reich, Hebrew, Huckabee, IDF, Israeli, Israeli Land Council’, Jewish, Jewish State, Lebensraum, living space, Muslim, Nuremberg trial, Palestinians, Palin, Reichskommissariat Ostland, relocation, Romney, Third Reich, Waffen SS, war crime, Warsaw Ghetto, zionist. Bookmark the permalink.